When you want to know the exact birthday of a famous artist, when you want to get the quick fix to a troubling issue, be it a problem related to your study or physical health, it is possible to get the effective suggestions or answers as long as you search the Google. While dwelling on the magic of the almighty Google, you should know that your Google search history will be saved on your Android device and won't perish by itself. Since such files contain your personal information, you are advised to delete Google Search history on Android at regular times, so as to eliminate any potential privacy leak. So you surely can't miss this Android Data Eraser software, which allows you to easily and efficiently delete Google search history on Android for good. So there is no need for you to worry that such Google search history will leak your personal information once they are seen by others with some bad ideas. 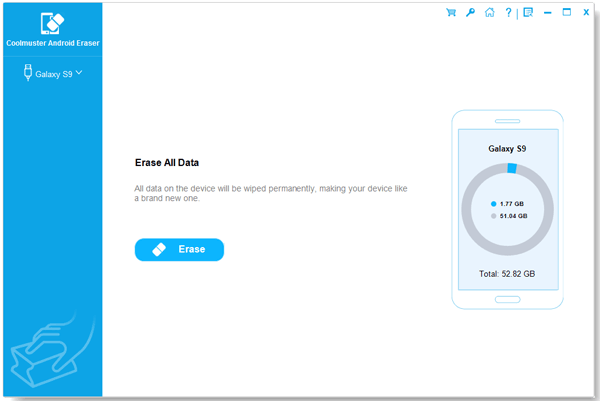 More importantly, this software also allows you to delete other junk files as well as useful yet unwanted files like contacts, messages, photos, videos, apps and many more. And all brands of Android phones/tablets can be perfectly supported by this software! Step 1. First of all, open the installed software on the computer and link your Android phone to the computer via the USB cord. Then this software will detect your device and show you the below interface. Step 2. After choosing the right erasing mode, all file folders will be arranged on the main interface as pictured in the below. You can now enter the right tab to preview more detailed file information. While previewing, just select the wanted files by ticking them out that you want to delete from Android device. Finally, hit the Erase option to remove Android Google search history in one click. Within a little while, all the selected files will be erased from Android! So also want to delete Google search history on Android? Just go ahead!